Rosemary "Mamie" Adkins was born in Houston, Texas, where she spent most of her childhood. Later, the family moved to Las Vegas, Nevada, where Mamie graduated from Bishop Gorman High School in 1965. From there, they moved to Redding, California for a brief time. Upon turning eighteen, Mamie fled the state and her home and moved around restlessly, until she found a happy place to land in Eugene, Oregon. Writing had always been a dream but not a reality until she traveled to Ireland. This magical paradise inspired Mamie to give it a try and she has never looked back. She had found her writing voice and pursued her dream in the form of a tell-all book about her extensive vacation in the format of a personal account of her travels, complete with tips, locations, photos, pricing, recommendations and so much more. 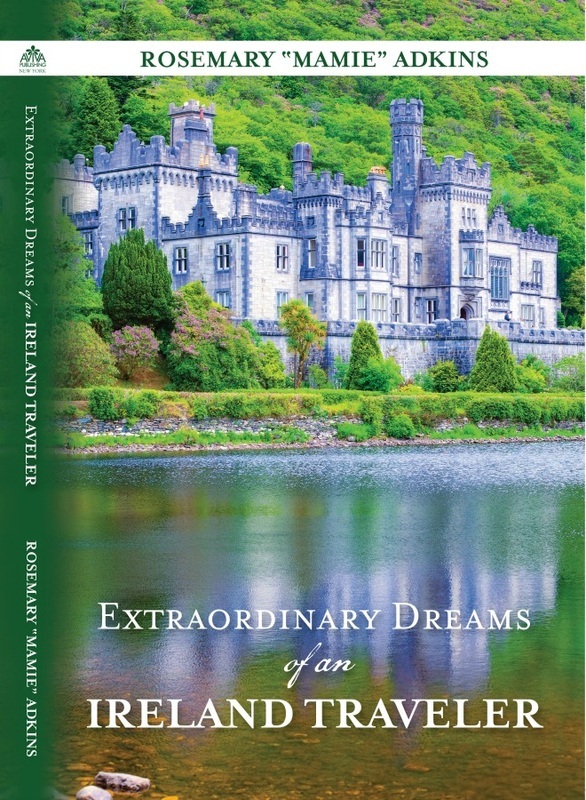 Extraordinary Dreams of an Ireland Traveler is now a sought after account of her travels, used by many who prefer her intimate account to the usual dry, travel literature. The trip was a tribute to her beloved husband Douglas, who had devoted many years to caring for her when she was ill.
Before returning from Ireland, Mamie firmly committed to writing her next book, which would be her personal memoirs, an account of her lifetime of physical and mental abuse. Now that she was firmly launched in the writing world, she was ready to pour her heart and soul into her signature piece to leave as a legacy to her family and to help others survive the trauma of abuse. Reflections of Mamie-A Story of Survival becomes a reality in June, 2013 and will be available here on Amazon, (as well as through her web site for your signed copies) and with international distribution. Reflections of Mamie begins at the age of four and takes her readers on her painful, yet sometimes joyful, journey through her lifetime of emotional and physical abuse at the hands of her mother. The writing of it was a difficult process as she struggled to unlock the horrific memories of her childhood and younger life, in an effort to finally free herself from the emotional prison that bound her. Mamie grew up unwanted, afraid and abused and she takes her reader on her journey of ultimate survival and love with the family she had always dreamed of. The story begins in the early 1950's suburbs of Houston, Texas. Mamie is a young child of four who was unwanted, afraid, abused and with nowhere to turn, learned that she had to stand alone. Her only friends were her older brother, an abused child himself, and her nanny, who begged their mother to stop beating them. The father, though he loved his children, remained passive to the end. A victim himself, the only protection he offered was a warning to stay out of their mother's reach. Her only thought: Never Give Up! Her only Dream: A Family to call her own. This story shares Mamie's heroic battle to keep her dreams alive and hold on to her spirit. How she finds her way out of fifty-four years of abuse is yours to discover in her fascinating memoirs. Find romance in Ireland while you move back in time learning about a history so compelling. Learn the locations you should not miss in Ireland and which ones you may want to think about twice. There are many tours available so come learn which ones are the best for your dollar - Come travel to Ireland with us! Travel from Dublin with us as we venture off on our own traveling along the East coast, inland and up the west coast to Galway. Many sites that will take your breathe away, romance your very being, surprise your senses with history and make you love each moment in time with the Irish and never meeting a stranger. Visit locations such as the Bunratty Castle, Blarney Castle, Kylemore Abbey, Cliffs of Moher, Blarney Woollen Mills, Guinness Storehouse, Waterford Crystal Factory, Aran Islnds and stay in locations from Bed and Breakfast to five star hotels. Learn where to dine for the best values and stay at the best locations in Ireland we found with offers that will save you hundreds of dollars-exclusive to our readers when you own this book! This is not just a travel book but tells you how to plan, our experiences, frustrations, how to pack, what to expect and we share with you a few human interest stories that are sure to tickle the curious inside each of you. So come on and let's travel to Ireland together! I have watched and admired Rosemary,(Mamie), since she published her first book. She is a fabulous writer, and a wonderful storyteller. She is also diligent and true in her Social Media Campaign. Her second book, on an extremely personal basis, is positively heartbreaking, and one can only wonder how she found the strength and determination to conquer all and still fulfill her dreams. My hat is off to you Mamie, and I wish you continued success and many, many book sales. You and your talent deserve it! !--Mary Firmin, author Deadly Pleasures.